Louis Cameron’s ‘NOW!’ (2016) poster emblazons the entrance of the Starless Midnight exhibition, a contemporary response to the historic basis upon which this collection was conceived. Fifty years ago, Reverend Dr. Martin Luther King Jr., the preponderant figure in the Civil Rights Movement, received an honorary degree from Newcastle University, the sole UK university to bestow such a doctorate to the civil rights leader. In an impromptu speech, King addressed urgent issues plaguing society, namely ‘the problem of racism, the problem of poverty and the problem of war’ – issues that regrettably remain prominent today. Co-curated by Edgar Arceneaux, who has worked extensively in reference to the work of King in his own practice, nine artists work to confront the dilapidating social and political climate within which we live. The room is curated to amalgamate the oblong posters of Hebron and Kenyatta A C Hinkle’s expressive drawings, possibly indicative of steps taken towards ethnic and gender equality – but how far have we come? In the series ‘The Evanesced’ (2016), Hinkle communicates her enmity in respect of the sixty-four thousand black women who have fallen victim to colonialism, homicide and other forms of erasure across the African and American diaspora. Prolific human trafficking present even at events such as the Super Bowl highlight the institutionalised mendacity towards minorities still taking place in 2017. Hinkle’s symbiosis of abstract forms and detailed figures delivers both contempt and raw vulnerability towards this extant racial discrimination. Karon Davies’ ‘Waiting Room’ (2016) provides an ambiguous introduction to Starless Midnight. 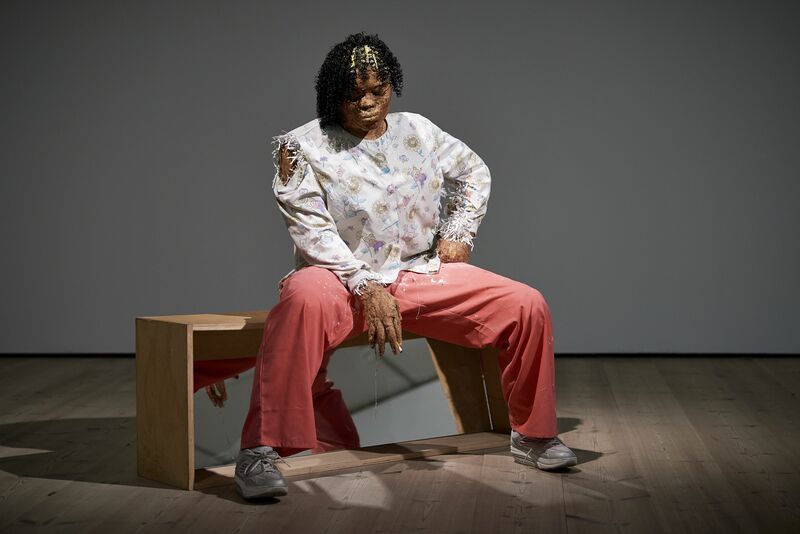 The installation has been built to exactly mimic a doctor’s waiting room, so much so that without its figurative sculptural counterparts (that reside elsewhere in the exhibition) it could easily be one and was in fact initially mistaken as simply a place to relax. Whilst the isolated figure ‘Nicotine’ (2017) successfully captures ethnic repression in being removed from the waiting room, the room itself requires further information for full comprehension. It is a waiting room for the prognosis of the world, a space ‘occupying a realm between life and death’ in a world still rife with racism, poverty and war, half a century after King besought the world to confront these grave problems. Starless Midnight, BALTIC Centre for Contemporary Art, Gateshead.